So it’s been awhile since I’ve written a review of the trading educational materials I’ve been working through. The last one I went through was Steve Nison’s Understanding Japanese Candle Sticks. It’s a DVD of a seminar that he provided. Not sure when it was recorded, but in reality it doesn’t matter. Steve talks about how these methods have long roots in Japan even before “stock” trading was known by it’s current name. In fact he talks about a famous rice trader who used these methods to know when to sell and when to buy. This was before any kind of ticker program or anything the States we’re implementing. So to say, it doesn’t matter, really puts it into perceptive about how powerful this really is and how long lasting the idea will be! One thing I have to say is, that when Timothy Sykes said I should know Japanese Candle Sticks, and that it’s important, he obviously didn’t get my attention. Because I thought I knew how to read a Japanese Candle Sticks. But boy was I wrong! I knew how to find the price and I could see where it was, but basically I could have been just as well off reading a bar chart! Steve Nison quickly shows that Japanese Candle Sticks show you the emotions and psychology of the traders at hand, it shows what everyone as a whole are thinking about the stock! And perhaps you already know that, and that’s awesome, but for people like me who had no idea, it’s like changing my TV from black and white to HD full color and surround sound! So lets examine a couple methods of understanding the psychology of a ticker! First thing you really learn with Japanese Candle Sticks is the Doji, and the Doji is basically saying that the market is confused about what to do. It does not indicate in any certain direction, but if you follow Timothy Sykes you’ll notice these Doji will appear and start to slowly drop over a trading day indicating the real direction and psychology of the ticker! Many times you will see Timothy short soon or later after a pattern of this! It of course does not tell you for certain it will drop, using Timothy Sykes rules and information will help you understand the news of the stock that can determine further what this Doji is likely to do later in the trading day (or days). Here in this example we see different types of Doji. The first one we see the first Doji example, but it shows a higher plane and lower plan before it reaches the middle, this can predict a large swing either way coming in the next several trading periods, but it also can just indicate what has been the whole time. People are confused and await more information before moving. The middle Doji shows that the trend opened and closed at the same point just like the first Doji, but in this one we see alot of bearish strength that took place, indicating a possible drop in price soon if nothing changes! Then we have the third Doji which is showing us strong bullish trends, but has a pull back to where it started. The shadow of the stock is telling us something more then just the current price, it is telling us what people are thinking, because the different between knowing the price and knowing where the price has been is a HUGE advantage over just knowing the price. Over the entire seminar Steve Nison shows more and more patterns that relate to Japanese Candling Sticking, even utilizing multiple patterns to indicate a possible move a certain way. 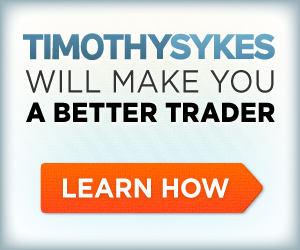 You’ll also notice if you are a Timothy Sykes student that he uses break out lines as well. The further you get into the Japanese Candles Sticks by Steve Nison the more you’ll see how Timothy Sykes can call the bottom or the tops of stocks he plays. Tim really, really, REALLY under plays the importance of understanding Japanese Candle Sticks and I think it’s time for you now to really get what’s going on! I’m going to add a short video for you to learn more, because lets face it, let the master tell it how it is! After that I would strongly encourage you to put forth additional effort and resources to understand this technology if you are a serious trader! Steve Nison has been doing this for a very long time and there are literally TONS of testimonials approving of his work! So if you are ready to understand exactly just went on here, check out Steve Nison’s website to learn more about how to use Japanese Candle Sticks in your trading strategy! Trust me from what I’ve seen and used so far, it’s a science you can not afford to ignore! This entry was posted in Reviews and tagged Bar Charts, doji, graphs, Japanese Candle Sticks, Psychology of Market, Steve Nison, stock trading, tickers, timothy sykes. Bookmark the permalink.